After splitting from her husband, Tami Wingfield couldn't afford to keep up with the mortgage on the home that they had shared. The monthly $1,600 bill was too much for her to bear alone, and in 2008, she lost the house to foreclosure. Like many people who lost their homes in the housing collapse, Wingfield decided the next logical step was to rent. But that didn't mean she had to give up the lifestyle of a homeowner. Wingfield and her three children have managed to stay in a four-bedroom single-family house all to themselves – they just don't own it. They're part of a new class of American renters that has emerged in the wake of the housing bust: people who lost the houses they owned and are now renting single-family homes. Ironically, many of these rental homes are a reflection of the troubles that once plagued the renters. They used to be owned by other families who lost them in the downturn. Now they're owned and rented out by investors who purchased them at a discount. At least 1.75 million renters in the U.S. have gone down the same path as Wingfield, according to data from analytics firm CoreLogic. Wingfield rents her $1,000-a-month home in Goodyear, Ariz., from The Empire Group, a development and investment firm that bought it as a foreclosure. She has a backyard where she's planted a garden, and she's on a desirable suburban street lined with quaint homes just eight miles from the house that she owned with her husband. It's as if hardly anything has changed. 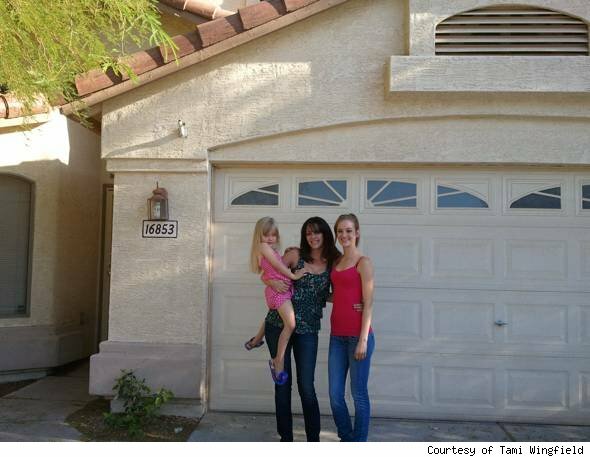 "I am able to provide my daughters and myself a nice home," Wingfield said. "I don't have to find a parking spot when I come home, tired from working double shifts at the hospital. I pull my car into the garage and walk into my house." Being able to maintain a homeowner's lifestyle, even as a renter, has also helped her continue to feel like a part of her community. "You can establish a place in the neighborhood -- get a school for your children," Wingfield said. "The buses run in the neighborhood.... There's parks and sidewalks to walk your dog." Empire, which owns about 1,000 homes in the Phoenix area, spends close to $7,000 a pop to restore each of the distressed properties that it purchases. Its average rental home is 2,100 square feet and goes for $1,050 a month, said Geoffrey Jacobs, a principal at the company. Jacobs said Empire, which started off as a developer, "put on the investor hat" in 2009. "It was an opportunity for us to take advantage of something we never thought we'd see again," he said. Investors provide the capital that Empire needs to convert homes into rentals, and the company turns a profit by taking a cut of the monthly rents that it collects and distributes to investors. Empire is just one of many firms that are snapping up bargain homes and leasing them to families like Wingfield's. And with rental rates soaring nationwide, the business strategy is currently lucrative. As of January, investors are raking in an average 8.6 percent return on their investments annually, according to CoreLogic. That's a 3 percent increase from 2006. And there are 21 million units in the country's single-family rental inventory, putting the size of the market at a whopping $3 trillion, CoreLogic said. That might be a good thing, since millions more borrowers are headed toward foreclosure and may flood the rental market. If that happens, it could continue to push up rental prices and lure more investors into the market, experts have said. Many of these single-family renters are like Jacobs' tenants, whom, he said, are "fairly conscientious people that just went through a foreclosure crisis" and want to retain some semblance of homeownership. People like Michael Williams, who lives in Memphis, Tenn. When he couldn't find enough work, he was forced to sell his home in a short sale in 2011 for $110,000 -- nearly $40,000 less than he owed on his mortgage. Now he lives in a single-family rental, which costs him $1,025 a month. He said that he feels "blessed" to still be able to reside in a home of his own close to his old neighborhood. "I'm partial to a home," he said. "I have my own privacy, and [I also] have grandkids." Williams rents from Memphis Invest, an "REO-to-rental company" that purchases homes in Dallas, Memphis and Phoenix and flips them to "mom-and-pop" investors. REO is real estate parlance for bank-owned properties. "They're looking for stability and still have pride of ownership," said Chris Clothier, a partner with Memphis Invest, of its tenants. But will these homeowners-turned-renters ever return to homeownership? One possible way back in is through landlords selling their tenants the homes that they occupy. Williams said that his lease agreement stipulates that he could purchase the home he's living in if his credit score improves and he saves enough for a down payment. HomeVestors WFI in Stafford, Texas, which manages about 600 rental properties, said it also may offer tenants the opportunity to buy the homes that they occupy. "We would either sell that home to them or help them how we can," said Rickey Williams, president of HomeVestors. In fact, renters of single-family homes may need to be in the position to buy again -- and soon. With home prices on the rise, many investors may want to sell, said Jed Kolko, chief economist at listing service Trulia. So if the renters aren't ready to buy -- and recently foreclosed-on homeowners may not be -- they'll have to move. Still, the boost in the single-family rental inventory has been a positive force, experts have said. They not only offer comfort to once-beleaguered families, but they help to stabilize the housing market by chipping away at the foreclosure inventory. "It is a good thing for people who need homes to be in homes that need people," Kolko said. Do you rent a single-family home? Email me at: teke.wiggin@huffingtonpost.com. We want to hear your story. Home prices in Sin City are still greatly depressed -- down 62% from the 2006 peak, according to the S&P/Case-Shiller home price index -- making for some great bargains for investors. Meanwhile, rents continue to climb, according to a recent report from HomeVestors based on analysis by Local Market Monitor. Of the 316 markets Local Market Monitor reviewed, Las Vegas ranked number one based on estimated returns on investment for single-family rental properties. Cities were ranked by estimated future returns investors can expect when they buy single-family homes and rent them out. According to Local Market Monitor's data, for example, investors in Las Vegas will have a 5.6 percentage-point higher return on a rental property than the national average of 5%. But there are risks with investing in cities like Vegas. The markets with the highest ratings are typically those where home prices have plunged the most, said Ingo Winzer, founder of Local Market Monitor. And in Vegas, investors are buying up so many properties and turning them into rental properties that there is a glut in supply, said Winzer. In some cases, that could make it hard to find tenants. And letting a property sit vacant could take a big bite out of profits since an empty place can pile up expenses quickly, he said. In a market like Daytona Beach, where the median home price is down to $91,000, most homes are very affordable. But many locals still aren't buying. "By and large, single-family homes are not priced beyond the reach of renters," said Winzer. But bad credit histories, often due to past mortgage payment problems brought on by Florida's severe housing bust, have made it difficult for many local residents to get mortgages, forcing many to rent. For real estate investors, that means there's plenty of demand. And the risks associated with renting in the area, which was hit hard by the housing bust and recession, have also started to subside. Unemployment dropped by 1.9 percentage points to 8.7% over the past 12 months. Even with the lingering economic issues in the area, there's a lot of potential reward, according to Winzer. The estimated return for landlords in Daytona is about four percentage points higher than the national; average, according to HomeVestors. Landlords in Orlando have been seeing a nice return on investment recently. Rents in the metro area rose about 7% over the 12 months ended in March, according to Rent Jungle, as homeowners displaced by foreclosure sought rental properties. For those looking to buy in this market, properties are pretty affordable: Home prices are down to levels not seen since 2000, according to data from NAHB. With Orlando's economy on the mend, the risks for investors are fairly low, said Winzer. Orlando's unemployment rate has come into close alignment with the national average, standing at 8.2% in April. Plus, the metro area population continues to expand, rising 1.5% in the 12 months ended July 1, 2011, sparking more demand for rental housing. General Motors put Warren on the map in the 1950s, employing thousands of engineers and technicians and making the town one of the wealthiest in the state. But when car sales collapsed, so did the local economy. The median home price in Warren has dropped to $114,000 from $175,000 in 2005, according to NAHB. As in Detroit, the biggest risk for investors in Warren is the economy, according to Winzer. If the auto industry continues to heal, the market for rental houses should remain steady. Winzer expects to see a slight increase in the metro area's home prices by 2015 and to see rents climb as well as the auto industry continues to rebound. When the housing bubble burst in Bakersfield, it really hit hard. Many residents lost their homes to foreclosure, leaving them little choice but to move into rental properties. That has been a major boon for landlords in the area. In the 24 months ended in March, rents increased by more than 20%, according to Rent Jungle. For those looking to get into the market, home prices are cheap at a median of $115,000, according to NAHB, That's almost 60% below the high set back in 2006. Given that Bakersfield has a diverse range of industries -- oil and gas production, agriculture, manufacturing -- it's a lot less risky than a city like Detroit, said Winzer. That said, Bakersfield is still struggling to recover from the severe hit it took when the housing bubble burst and unemployment -- which stood at 14.5% in April -- is still a major issue. However, if jobs recover a little more quickly, real estate investors could be rewarded with some modest home price appreciation -- in addition to their rental profits, said Winzer. Phoenix has become an investor's market, with many of the city's properties being turned into rentals to house those displaced after the housing bubble collapsed. Demand for rental properties in the area has helped rents climb by about 7% over the past two years, according to Rent Jungle. Also on the rise is the local economy. "Phoenix is doing much better than I thought it would," he said Winzer. "The economy has recovered nicely, growing 2.2% over the past 12 months." But for investors, the best time to act may be sooner rather than later. Housing inventory in Phoenix has shrunk and home prices are on the rise. During the first three months of the year, home prices were more than 5% higher than they were in the year-ago period. A knotty foreclosure problem has plagued Atlanta's housing market, with thousands of vacated homes weighing on home prices. In March, the city recorded a 17.7% drop in home prices, the largest 12-month decline of any of the 20 cities covered by the S&P/Case-Shiller home price index. Displaced former homeowners have helped push rents 12% higher over the past 12 months, making for some healthier returns for investors. However, the risks remain in Atlanta, with plenty more foreclosures still being moved through the pipeline. Unlike most of the other cities on this list, Reno's market is more popular for investors looking to buy vacation -- rather than residential -- properties. "Reno is much more of a second home market for people from Northern California," said Winzer. As such, it tends to reflect the market trends of cities within an easy drive, including Sacramento, San Jose, and, especially San Francisco. But while Reno's status as a major vacation destination can be attractive to investors, it can also be a risk. "Vacation home markets tend to be volatile," said Winzer. The prices may track the trends of coastal markets but the swings can be much greater. One saving grace for investors, however, is that home prices are much lower in Reno than they are in other major cities. At a median of $137,000, Reno homes sell for about a quarter the price of San Francisco real estate. And rents should bring in above average returns, about 2.5% percentage points higher than the nation as a whole. For investors, Tampa seems like a perfect place to buy a rental property. At a median price of $100,000, homes are relatively cheap. And rents are on the rise, having gained about 4% over the 12 months ended in March, according to Rent Jungle. In addition, the economy is on the upswing, with a recent uptick in job growth. However, there are some risks that real estate investors should be aware of, according to Winzer. One problem: An abundance of shadow inventory of homes in foreclosure that are already repossessed and vacant but have yet to come on the market. When they do go on sale, they could push home prices even lower but also make it more difficult to find tenants.